The Muslim student puts his trust in Allaah when facing the tests of this world, and he seeks His help while following the prescribed means, in accordance with the words of the Prophet, sallallaahu ‘alayhi wa sallam: “The strong believer is better and is more beloved to Allaah than the weak believer, although both are good. Strive to attain that which will benefit you and seek the help of Allaah, and do not feel helpless.” (Reported by Muslim, 2664). Here are some tips for writing an exam. Remember, hard work and studying well are the first steps toward success in an exam. Getting enough sleep affects how you function. Therefore, it is vital that you have a good rest before the exam day. Sleep early and arrive at the school on time. Organizing all the required or permitted equipment such as pens, rulers and setsquares, calculators and watches, because being well prepared helps one answer the questions well. Do not forget to seek your parents’ approval, for their Du’aa for you will be answered. “O Allah, there is none worthy of worship besides You. You are Pure, definitely I have oppressed my soul by sinning”. The Qur’an states that these words were recited when Yunus (A.S.) called upon Allah from the belly of the fish. Prophet Mohammad (S.A.W.) stated in a hadith that when any Muslim makes this dua via these words to Allah, then Allah surely accepts his duas. Mention the name of Allaah before you start, as mentioning the name of Allaah is prescribed when beginning any permissible action; this brings blessings and seeking the help of Allaah is one of the means of strength. 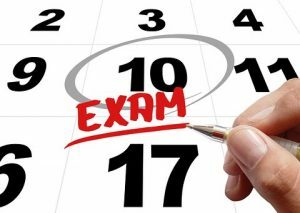 Do not be affected by the anxiety or fear of your classmates just before the exam, for anxiety is a contagious disease. Instead, make them feel optimistic by saying good words as prescribed in Islaam. The Prophet, sallallaahu ‘alayhi wa sallam, was optimistic when he heard the name of Suhayl (which means “easy”) and he said: “Things have been made easy for you.” He used to like to hear the words ‘Yaa Raashid’, when he went out for any purpose. So be optimistic that you and your classmates will pass this exam. Remembering Allaah (Thikr) dispels anxiety and tension. If something is too difficult for you, then pray to Allaah to make it easy for you. Choose a good place to sit during the exam, if you can. Keep your back straight, and sit on the chair in a healthy posture. Look over the exam first. Research studies advise spending 10% of the exam time in reading the questions carefully, noting the important words and dividing one’s time between the questions. Plan to answer the easy questions first, then the difficult ones. While reading the questions, jot down notes and ideas which you can use in your answers later. Answer questions according to their order of importance. Start by answering the easy questions which you know. Then move on to the questions which carry high marks, and leave the questions to which you do not know the answers to the end, or which you think will take a long time to calculate an answer or which do not carry high marks. Take your time to answer, for the Prophet, sallallaahu ‘alayhi wa sallam, said: “Deliberation is from Allaah and haste is from the Shaytaan.” (A Hasan Hadeeth. Saheeh al-Jaami, 3011). In written exams, collect your thoughts before you start answering. Write an outline for your answer with some words which will indicate the ideas which you want to discuss. Then number the ideas in the sequence in which you want to present them. If you discover after the exam that you answered some questions incorrectly, then take that as a lesson in the importance of being well prepared in the future, and not rushing to answer questions. Accept the will and decree of Allaah and do not fall prey to frustration and despair. Remember the Hadeeth of the Prophet, sallallaahu ‘alayhi wa sallam: “If anything befalls you, do not say: ‘If only I had done such and such.’ Rather say: ‘Qaddar Allaah wa maa sha’a kaan (the decree of Allaah and what He wills happened),’ for saying ‘if only’ opens the door for the Shaytaan.” (Reported byMuslim, and the first part of this Hadeeth was mentioned above). Note that cheating is Haraam whether it is in foreign language tests or any other tests. The Prophet, sallallaahu ‘alayhi wa sallam, said: “Whoever cheats is not one of us.” It is wrongdoing and a Haraam (unlawful) means of attaining a degree or certificate, etc., that you have no right to. The consensus is that cheating is a kind of cooperation in sin and transgression. So do without that which is Haraam, and Allaah will suffice you from His bounty. Reject all offers of Haraam things that come to you from others. Whoever gives up a thing for the sake of Allaah, Allaah will compensate him with something better. You have to denounce and resist evil, and tell the authorities about any such thing that you see during the exam, or before or after it. This is not the forbidden kind of slander; rather, it is denouncing evil which is obligatory. Just like wordly exams, remember that we have an exam in front of Allah as Well. Remember what you have prepared for the Hereafter, and the questions of the examination in the grave, and how to be saved on the Day of Resurrection. Whoever is saved from the Fire and admitted to Paradise will indeed have succeeded. For an instant there, I am relieved.